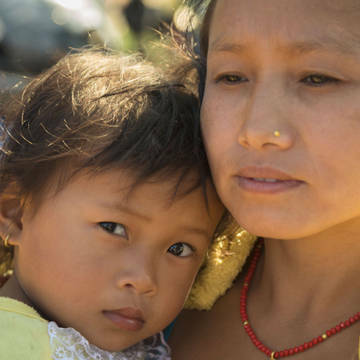 This month marks one year on from the launch of our Nepal Earthquake Appeal following two devastating earthquakes which hit Nepal in April and May 2015, forever changing the lives of more than 5 million people. Thanks to your generosity and compassion in responding to the Appeal, we raised over £3.8 million which has gone towards helping vulnerable families affected in some of the worst hit areas. Kamal Thalea, 33, is just one the survivors who has received support. Kamal lost her son, two daughters and her mother when their house collapsed on top of them. They were among at least 8,700 people who died when the first of two earthquakes hit Nepal on 25 April 2015. Kamal and her one surviving daughter, who was playing outdoors when the earth shook, were forced to sleep under nothing but a tarpaulin in the wake of the disaster, which destroyed half a million homes. But one year on, thanks to your donations and the work of our partners, they have a sturdy shelter and a means of earning a living. Kamal has received training to grow vegetables, and now has her own tomato garden. “I am earning an income and my daughter can continue going to school,” she said. In the immediate aftermath of the earthquakes our local and Caritas partners provided aid to hundreds of thousands of people, including food, shelter and hygiene and sanitation kits. One year on, our partners continue to work in some of the hardest to reach parts of the country, reconstructing classrooms and water systems, and helping people to make a living. Our partners in Nepal have faced many challenges over the last year, including monsoon rains blocking roads, fuel shortages and price hikes due to blockades along the Indian border, as well as delays in establishing the government’s National Reconstruction Authority, which coordinates the reconstruction of earthquake-proof houses. Attention is now turning to the massive task of reconstruction, and supporting families to rebuild earthquake resilient houses. In Gorkha District, our partners have trained more than 200 construction workers in earthquake-proof techniques. Training has also been given to families who plan to rebuild their homes more safely as soon as they receive the government shelter grant. Some have already started using the new techniques. “We must also remember that hundreds of thousands of families are still living in temporary shelters, said Chris Bain, “with the rainy season approaching there is an urgent need to speed up the pace of reconstruction, so that families do not spend another monsoon under iron sheets and tarpaulins”. The millions of Nepalese affected by the earthquakes are desperate to rebuild their homes, and their lives. We remember those who lost their lives and the millions who are starting to rebuild their lives from scratch. Donate now and help get aid to families in urgent need.